The post office called at 5:07 yesterday morning to let us know they had just come in. Within minutes we were on our way to pick them up. We lost one in transit, and two seemed possibly injured, and one was quite weak. DH set them up in a private brood box and we were able to transfer two of them back to the rest later in the day. These are obviously not the best photos in the world. The flash on my camera alarmed them so most of these are taken without. 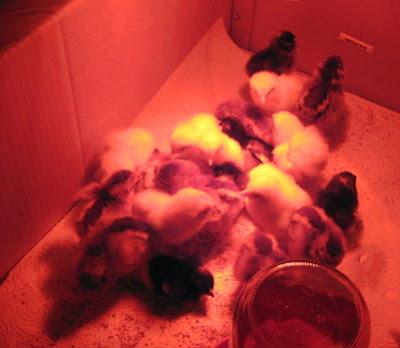 As you can see I purchased the recommended red heat bulb for my brooder lamp. Our original deliver date was supposed to be the last week of February. Several weeks ago the hatchery called and asked if they could move it up a couple of weeks. This was due to availability and demand. This was why there was something of a flurry over the coop roof, which happily neither leaked nor blew off in our last round of rain and wind. 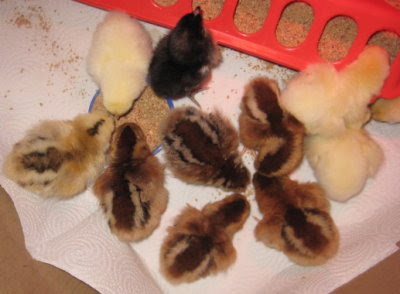 I ordered four breeds, six each of: Delawares, Barred Hollands, Welsummers, and Ameracaucanas. I ordered straight run, which means that theoretically I should get half pullets (girls) and half cockerels (boys). We'll see. The Delawares are most of the yellow chicks. You can learn more about that breed and look at photos of them here. The dark chipmunk colored ones are Welsummers. Click here, for more info and photos of that breed. Most of the black ones are Barred Hollands. These are the smallest and least active of the lot. The one that died and the weaker ones were Barred Hollands. More information with photos here. All the rest are Ameracaucanas, who come in various colors. More on this breed here, along with photos. These are different from what I was originally thinking about. Part of the reason was based on a comment from Laura (unfortunately blogless). One of her suggestions was to choose a heritage breed. That struck a cord with me, so that part of the decision was easy. Which breed, was much more difficult. The more I read, the more I realized that every chicken owner has different preferences and different favorites. I finally narrowed it down to those four breeds. All four are considered rare breeds. Two, the Delaware and Barred Hollands, are American Heritage breeds. From these we will hopefully develop a preference, and we'll keep a rooster from that breed. Besides choosing breeds I think are handsome to look at, we will have a real rainbow of egg colors! Delawares lay brown eggs; Barred Hollands, white; Ameracaunas, blue-green; and Welsummers, chocolate brown. Two inches by the time we went to bed. A welcome change from rain. Today it's supposed to be mostly sunny and get up into the mid 40sF, so I suppose it will be good bye snow. DH got part of the garden tilled before the snow came, so hopefully I can get my garden peas in the ground soon! Now you've had more snow fall in February than we have. Isn't that weird? 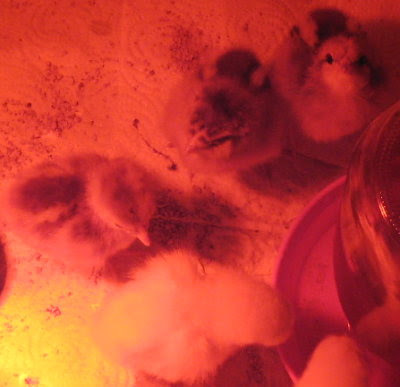 I cannot wait to follow along with the progress of the chicks. When I visited Riverslea on Monday, their hens had just started laying again. Definitely a sign of spring. I am so excited that you have chicks, Leigh! I got my chicks last Oct and am still going on and on over them. I have to stop my self at work from talking about the chickens, no one there has a farm or understands or wants to discuss all things chicken. So congrats on the new additions! PLEASE post lots of pics! Welcome CHICKIES! Aren't thy a cute flocks worth! Snow, I would imagine not so welcome. This is so exciting. 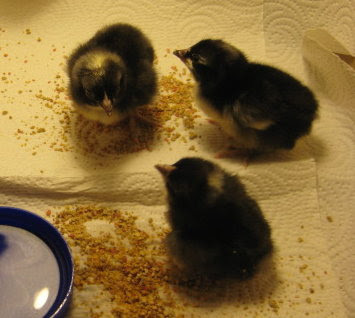 Yours is the second "new to me blog" where I can share in the arrival of baby chickens... what a treat for me. I hope they thrive. Ameracaunas are the only breed I have experience with; our Gracie was the sweetest pet chicken ever and her green-blue eggs were a pretty sight. It's nice to meet you Leigh, and thank you for visiting Chickenblog. I'm in the boat with Razzberry Corner- I think I drive my coworkers NUTS talking about my chickens!!! Congrats on your new additions- they're adorable!!! And I also got half of my garden lightly tilled before our 2 inches of snow! Just in time! I can't wait for spring! Congrats on your chicks! Is there anyway to get compensation for the chickie who didn't make it? I have 4 homeschooling friends who have urban chicken "farms" (keep chickens in the city). 2 have had no issues at all but the two who live in one of our older neighborhoods have had fox issues. and one gal had some issues with her chicks when she first got them... she wanted her chickens to "free range" over her yard in the day and then go in the coop at night... but she didn't get the chickens used to the coop first, so for the first few nights she had a hard time getting all her chickens in the coop. We heard lots of herding chicken stores! Unfortunately she lost all her chickens in a fox incident and is starting over, so hopefully she'll not have coop issues again. Sue, I can see why it's no wonder that eggs and baby chicks are symbols of Easter. And I have to say that I'm looking forward to some sign of spring myself! I have daffodils sprouting, but no flowers yet. Lynn, thanks! They are so cute it's hard not to talk lots of photos. :) It's too bad some of your co-workers don't get interested in having chickens of their own! MMM, I would love to get some ducklings someday too but DH isn't as keen on them. But who knows, he may change his mind once we put in that pond! Natalie, thanks for the return visit! It's nice to find your blog and I look forward to reading regularly. Bettina, I know what you mean. We had a similar concern but I couldn't find what I wanted locally. Plus, most of what was for sale is older birds, usually several years old and past their laying prime. I don't understand why folks want to see them for $10 a piece though. But then there's a lot of things I don't understand. Wife of FRH, thank you! And congrats on your first eggs! You got the same amount of snow we did. Let's hope we can get into the tilled part of our gardens soon! Renee, I had to laugh at the free range story. That's one of the times experience is an excellent teacher. Bad news about the fox issue though. We've been wondering about critter problems here. We haven't seen anything besides deer, but that doesn't mean something isn't out there. Yay! Baby chicks! And so many interesting breeds! The Barred Hollands sound neat. I'm incredibly jealous -- we can only have three hens in our city. Can't wait to follow along as they progress. The weather is so weird. 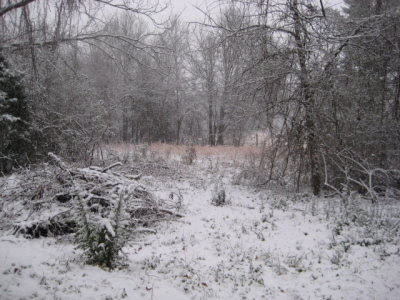 We were snowed in during December, traditionally snowless. We should be snowed in this month and nothing. In fact, it was a delightfully sunny day, appropriate for May. I remember how exciting it was to stop at the feed store and get the pullets in spring. Mom and I would stand around the brooders and she'd selected her new crop of chickens. They're like holding a little cloud. I'm so glad that Mim has decided to raise chickens. I get all the eggs I need without the expense. Chicks always remind me of Spring. Hope you are having fun watching the little fuzz balls. They're so cute! Badgerpendous, I think it's neat you can have even three in the city! I was amazed at the output you mentioned on your blog. Sharon, what a great memory. But you mean to say you don't miss having the chickens? We haven't had ours very long, but already they feel like they are supposed to be a part of our lives. Cally, may spring not be far behind! I hope to have some someday so I'll be very interested in watching yours grow up. The little chicks are so cute! I hope Rascal doesn't take too keen an interest in them until they are a bit bigger. They are so cute! I'm so excided for you and can't wait to see them grow! You've got babies. How cute!!!!! 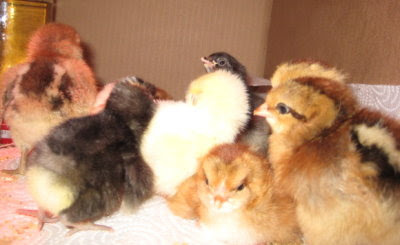 Like a lot of other bloggers I remember when we'ld go to the post office to get out chicks. 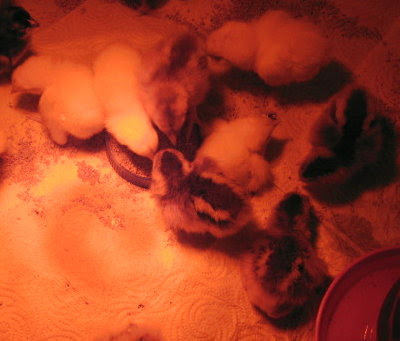 The chicks are incredibly cute! Stay warm all of you! They are so cute! When we moved here there was a hen house in the garden. We exchanged it with our neighbours for storing garden stuff. We got two ornamental bushes that are still going strong 14 years on. Even if I wanted to raise chickens here there are so many foxes passing through our garden. Today I saw two at 07.24, and another at about 09.30. We live in a town in derbyshire. Congrats on the new baby chicks. How fun. I was just in at the farm store yesterday and saw some. Then I got the baby chick urge. Thankfully I was able to contain myself. I really don't know what I would do with even more eggs then what I have already. 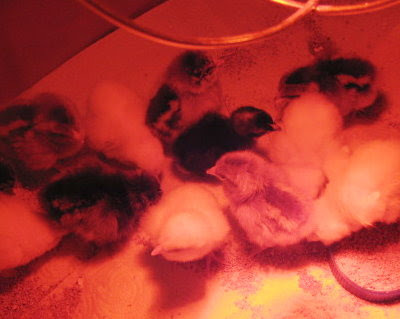 Lyneya, this is my first time to buy chicks and raise them. So far so good! Dorothy, amazingly he isn't' all that interested. Still, since we have them in the house (my studio actually), the doors to it are closed if I'm not around. He is a cat after all. Julie, I'm told they grow pretty fast. At four days old you can already see their little wings growing. I'll have more photos soon so you can compare. Mary, foxes in town? Wow and gosh. Several folks have mentioned problems with foxes. I don't know if we have them around here or not. I suppose once the chickens are in the hen house, we'll have all kinds of critters show up that we didn't know about. Robin, that's pretty good self control! *lol. They really are cute and hard to resist.